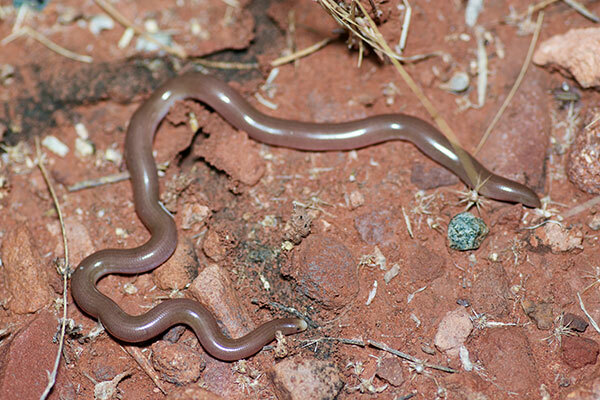 This was the smallest and squirmiest of the snakes I saw on this month-long trip to Australia. Its squirminess was really quite impressive. It had been crawling across the road at a moderate pace when I tried to block its progress with my hand, so it would stop moving and I could get photos. When it touched me it exploded into paroxysms of squirm, and was off the road and onto the gravelly shoulder in about half a second, whereupon it instantly disappeared from the range of my flashlight. I swept the flashlight beam to and fro in a reasonably methodical manner and relocated it. It was still moving, but back at a normal pace. I tried to move closer for photos, but this caused a second fit of crazy squirming, and once again I temporarily lost track of its position. When I rediscovered it this time I used the time-honored trick of cupping my hands over the snake in the hopes that it would settle down. It kind of worked; I got two photos before it went nuts again. I didn't want to sap all of its energy, so at this point I left it alone.